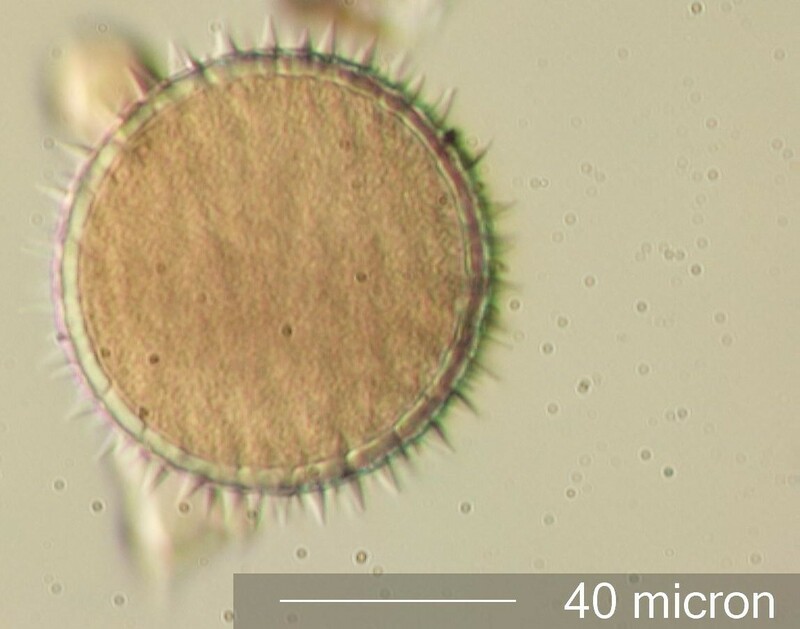 This pollen grain was recovered from honey sold as Washington State "Sweet Clover Honey". There was some sweet clover pollen but it was not the dominant pollen in this sample. This view is an optical section just below the upper pole of the pollen grain. The grain is "echinate" (spiny) and the "nexine" of the grain (consisting of the "endexine" and the foot layer of the ektexine) of the grain has columns that support the "tectum" (outer layer of the "ektexine" with the spines). These columns show up as the bright dots all over the surface with shading on the right of each structure when oblique illumination is used. The circular bright spots that are a little larger and shaded to the left of the structure are the pores.